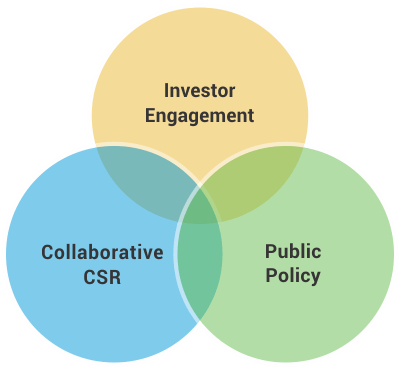 Targeted investor engagement is a means to optimize development and foster economic growth. CSL works with central and state governments, various government departments, and, corporates to map and drive corporate investments into various sectors and locations across India. We help corporates engage with governments to drive private investment through various modes that focus on specific sectors for maximum impact in a targeted and time-mound manner. Our work helps foreign and domestic investors confidently enter new markets in India with the support of government authorities. We also propose and recommend various incentives and policy measures to boost investments across sectors. In a developing country like India, inclusive growth is of paramount importance. State Governments put in their best efforts for the inclusive growth of the people, but could greatly benefit from additional support from the private sector through CSR (Corporate Social Responsibility) for an even greater impact. Corporates are aware of the importance of CSR in the present scenario but are not always aware of the right kind of CSR activities or even the locations or focus areas where their efforts can yield the greatest positive impact in the lives of the people. NGOs and other implementing agencies too work within the limits of their geography, associations with corporates and area of expertise. CSL has pioneered a tri-stage collaborative CSR model called SAJHEDARI which bridges the gap between the stakeholders – government, corporate and implementing agencies, by bringing them together on a common platform. We work closely with political leaders, government departments, policy makers, media, corporate, diplomats, and, national and international experts from varied fields among others. By conducting careful research and taking feedback from various stakeholders we submit recommendations for various policies and legislature. CSL has worked and provided recommendations on various government policies and has also conducted several programmes on generating awareness on new laws and policies. We also provide a platform for networking and consensus building within and across various segments including State, Central as well as International governments, and, commerce and industry bodies.